Triple-Double from John Wall Propels Wiz past Pelicans, 109-89. It wasn’t the best shooting night for Wall but that didn’t matter as the Wall-Star notched his second triple-double of the season with 16 points, 11 assists, and 12 rebounds. Marcin Gortat chipped in with another double-double with 21 points and 11 rebounds. And Jared Dudley scored 18 points on 6-10 shooting from three-point range. The arena was dead to start this one and both team’s energy to begin, mimicked the energy in the stands. The Wizards shot just 37.5 percent from the field in the first quarter but the Pelicans were even worse shooting just 33 percent in the first quarter. Anthony Davis, fresh off of his 59 point outburst in Detroit ended the night with nine points on 3-9 shooting. The lead would seesaw back and forth but the Wizards would have a three-point advantage, 54-51 at halftime. The Wizards started the third quarter on a 14-0 run to take a commanding 68-51 point lead and never looked back. Oh were there highlights in the second half. Marcin Gortat got things started by turning over Kendrick Perkins and dishing to Wall who dished it back to Gortat for the alley-oop. Markfieff Morris got into the fun with a steal, outlet to Beal, who gave it right back for a nasty dunk. 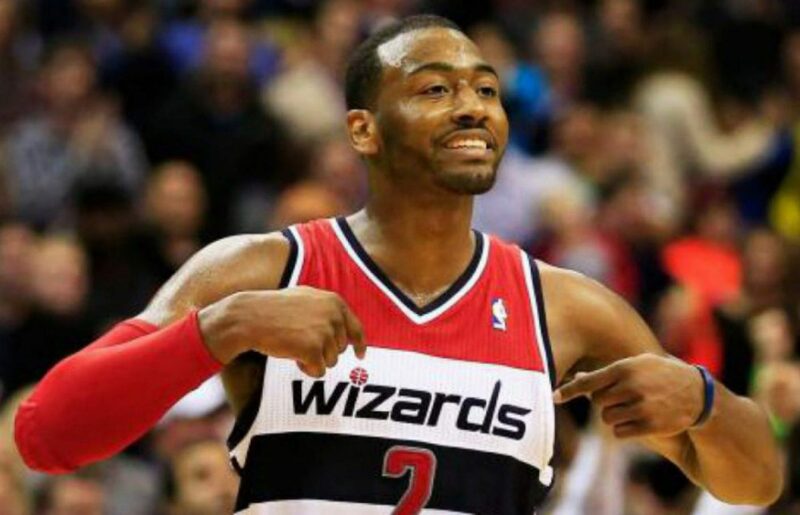 And let’s not forget the John Wall who claimed his second triple-double of the season with this three-pointer. The Wizards’ outscored the Pelicans 55-38 in the second half and would cruise to a 109-89 victory. Defense: The Wizards’ defense was outstanding tonight. The Wizards held the Pelicans to 35 percent shooting and just 26 percent from three-point range. The Wizards were not going to let Anthony Davis beat them so they double-teamed him early and often. Jared Dudley was up to the task to guard Davis and he didn’t disappoint. The Wizards have now held three of their last four opponents under 100 points and two of the last four under 90. Free Throw Shooting: As of late, the Wizards have really struggled from the free throw line. Tonight was no different as the team was 11-17 (65 percent) from the charity stripe. This must get addressed and addressed quickly. Poor free throw shooting has not cost this team any wins recently but eventually it will.